Here is my first entirely hand printed quilt top using my Melly Marks Lace Swirl Kit! 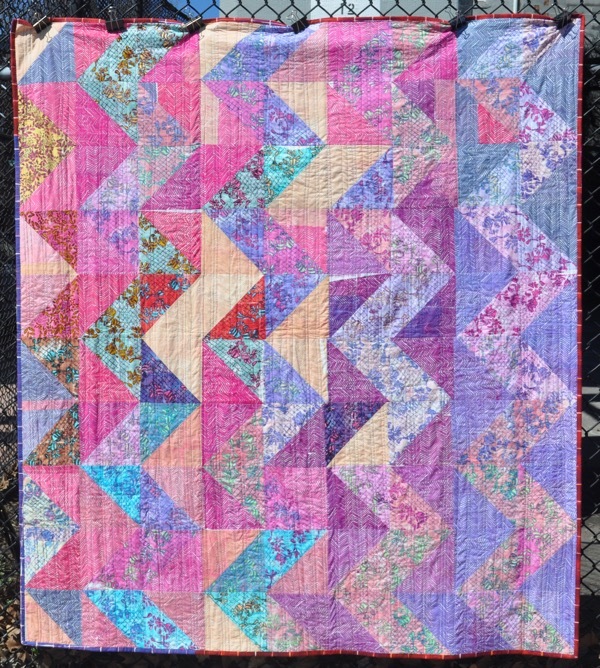 I am loving it, I love the movement of the zig-zag half square triangles, the gradation of colors, the simplicity too. Later in the process of making the quilt top, I nabbed a few handprints created using Swirl Vine Kit to fill out the pattern and make a few more blocks. You can see these above. I just needed specific colors and a few more pieces of fabric, and these were quickly available. 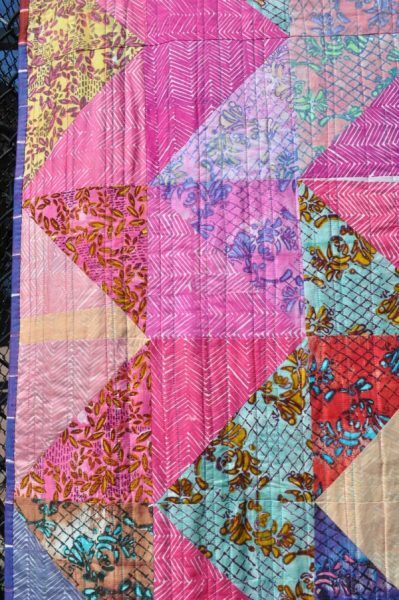 One thing that I have totally fallen in love with because of this quilt is printing on Cotton Sateen. The peach pink at left is an example of this, though it is quite difficult to photograph the subtle visual difference and in blog post, it is impossible to illustrate how soft this fabric is. I printed just a few pieces of the cotton sateen, I don’t have much on hand, but wanted to use it anyway and think it a success. Having even a few pieces of this cloth in the mix livens up the top tremendously, lending a subtle sheen and a soft touch. I tried to stay within an analogous area of the color triangle, from purple, reds and yellows. I printed a total of 34 Lace Swirl Prints and 54 Chevrons. This means I printed about 5 yards of cloth! 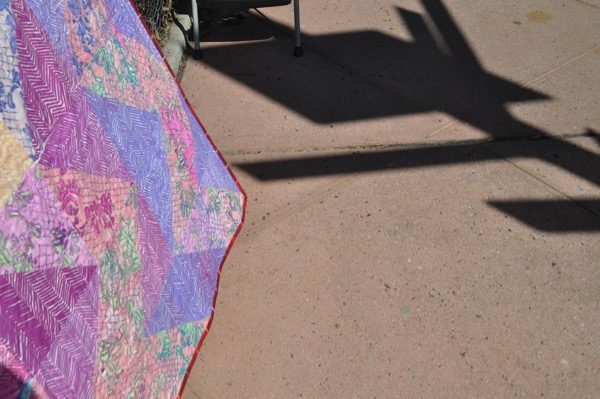 From start to finish, this quilt was printed, steamed, washed, cut, pieced, basted, machine quilted and bound in one months time! Wow. Pretty snazzy.